Building your first aid kit in Dubai isn’t as easy as putting a few bandages in a box and calling it a day anymore. Depending upon whether you’re in an office or home environment, where you’re located, and under what area you want the the first aid kit to be placed can affect its contents. As one of the major first aid box supplies in UAE, we’ve given a breakdown of the first aid regulations and items needed. For example, if you’re not located in any of the free zones, then you’d be subject to the Dubai Municipality requirements which oversees office environments, beauty saloons, health clubs, labour accommodations and more. Other places such as freezones may have their own requirements. For example, Dubai Healthcare City has mandated that each office needs to have a first aid kit and a trained first-aider. The first aid kit contents are different from those required by Dubai Municipality. While many pharmacies carry first aid boxes and kits, they’re not adherent to the regulations in most cases and would not protect you from any fines should an inspection occur. In this post, I’ll focus on first aid requirements under Dubai Municipality geared towards companies. Check out my other post about home first aid kits. Guidance Card. Every first aid box will need a guidance card to explain what is to be done in case of an emergency. This is surprisingly hard to find in many pharmacies but can be found at Red Crescent locations throughout UAE. Alternatively, you can click here and download a printable worksheet. Plastic Band Aids. Pretty much as the title suggests. These are available at any corner store. Adhesive Tapes. We suggest using Zinc Oxide tapes because they are stable for a long time and are hypoallergenic. Gauze Bandages. While the title suggests regular gauze bandages, we endorse conforming bandages as a superior alternative. They are stretchable and offer superior compression than regular gauze bandages. Gauze Pads. These refer to square pads used to dab away at cuts and wounds. The majority of pharmacies carry cotton ones in 8 or 12 ply (referring to the number of folds per pad) or non woven ones. Oval Eye Pads. Pads which are contoured to the shape of the eye. 2 types are usually available, one is a regular pad and another one is an adhesive eye pad which doesn’t need the use of tapes to keep the pad in place. Adult and child sizes available. Triangular Bandages. Triangular bandages are shaped so as to make makeshift arm slings. They usually come with a pack of safety pins. Ammonia Inhalant. 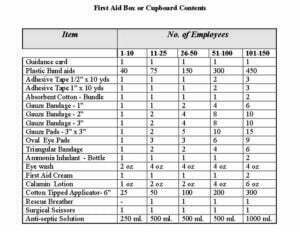 While the requirement is for an ammonia bottle, which is extremely difficult to find in a size that would fit in a first aid box, many kits contain inhalant capsules which can be broken near the nose to induce consciousness. Eye Wash. While most industrial facilities have eye wash stations, an optrex eye lotion is a suitable alternative for an eye wash.
First Aid Cream. This refers to an antiseptic cream suitable for cuts, scrapes and light wounds. Calamine Lotion. This lotion is used for sunburns, scalds and burns. It’s also used for insect bites and for chicken pox outbreaks. Cotton Tipped Applicators. Used for dabbing at small wounds and cuts where the gauze pads would be too much. Rescue Breather. This is the term used by Dubai Municipality for CPR Masks. It contains a mouldable face mask and a one way valve that helps people induce resuscitation. Surgical Scissors. First aid kits need them for cutting away and clothes or cutting away at bandages without damaging the skin. Take a look at our bandage scissors here. The above breakdown is not a valid form of medical advice and all caution must be taken. For further clarification, contact Dubai Municipality or a licensed first aid technician.